Well, I’ll make this short. You’re on vacation, I’m on vacation, ever’body on vacation. Who’s actually reading this right now? You probably aren’t going to read an encyclopedia of information about bread; but neither am I in a position to provide it. This week, I’ll be discussing Christmas breads, as nearly every people, nation, and/or region in the world has a traditional Christmas bread. 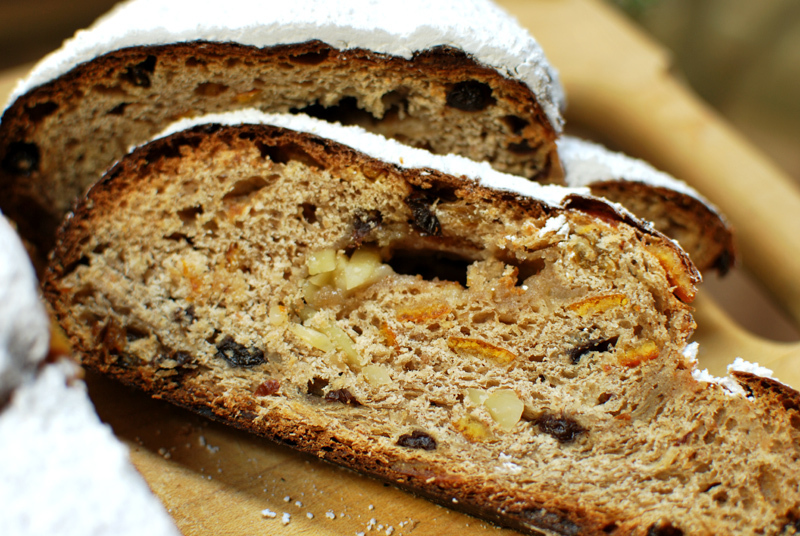 First up is stollen, a Christmas bread from Germany. Like most celebratory breads, it’s thoroughly enriched with butter, milk, sugar, and eggs; and like many European holiday breads, it’s full of liquor-soaked dried fruits. But unique to this bread, there’s a roll of marzipan swaddled in the middle of the dough, which I’m told is meant to represent the baby Jesus, wrapped in his swaddling cloth (of dough). Dusted with powdered sugar, it’s as pretty a sight as you’ll ever see. The bread is relatively firm, and gets firmer as it sits. In fact, the traditional wisdom states that you shouldn’t even cut into the loaf for at least three days; though some purists insist it rest for even a few weeks before slicing. This firmness is not a detriment; it helps the loaf cut more easily into clean slices, perfect for dunking into coffee for a Christmas breakfast (or dessert). Kept moist by the brandy-infused dried fruits and marzipan, this bread will keep for at least a week at room temperature, wrapped tightly; though it will remain palatable, if a bit dry, for as long as you can manage to keep your hands off it. Mostly dried fruit, held together by the merest network of bread, this heavy loaf would be a delightful addition to any holiday tradition. 1. Place the currants, raisins, and golden raisins in a plastic zip top bag. Add the brandy or rum, and squeeze as much air as possible out of the bag before closing. (This maximizes the surface area contact between the fruit and the liquor, and makes sure no fruit is left dry.) Soak for at least 8 hours, and up to several days. 2. In the bowl of a stand mixer, whisk together the flour, sugar, yeast, salt, spices, and lemon zest. Set aside. 3. In a small skillet, bring the milk and rye flour just to a boil, stirring constantly. It should resemble a thick porridge. Remove from the heat and let cool slightly. 4. In a clean bowl, combine the boiled milk mixture and the melted butter. Stir until blended; then add the eggs, stirring constantly. Add the liquid mixture to the dry ingredients in the mixer bowl. Using the dough hook attachment, mix at low speed until a rough dough forms and all the flour is moistened. Without removing the bowl or the dough hook, cover the bowl loosely with plastic wrap, and let stand for 15 minutes. 5. Remove the plastic wrap, and add the candied orange, candied ginger, and brandy or rum soaked dried fruits. Mix at low speed just until incorporated, 2 to 3 minutes. 6. Transfer the dough to a large, lightly oiled bowl. Cover tightly with plastic wrap, and let rest at room temperature until nearly doubled in size, about 90 minutes. 7. 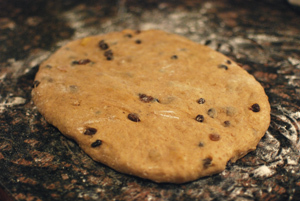 Turn the dough out onto a lightly floured work surface, pressing gently to deflate. Press into an oval shape, about 3/4 inch thick. 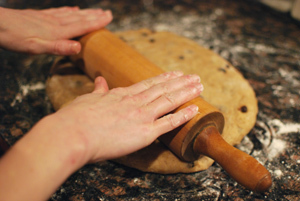 Using a rolling pin, make an indentation in the dough lengthwise down the oval, slightly off-center, as shown. 8. Shape the marzipan into a cylinder slightly shorter than the length of the dough. 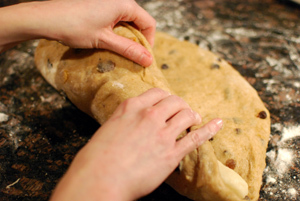 Place the marzipan in the indentation in the dough. If using, sprinkle slivered almonds over and next to the marzipan. Roll the dough over the marzipan, pressing the sides firmly together to prevent any marzipan from leaking out while baking. Press but do not firmly seal the final seam. 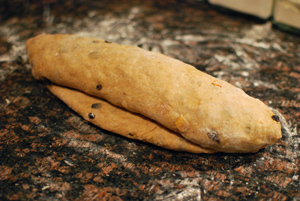 A short lip of dough should be sticking out from underneath the roll, as shown. 9. 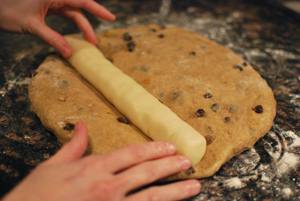 Transfer the dough to a lightly greased or parchment paper lined baking sheet. Cover loosely with lightly oiled plastic wrap and let rise at room temperature until doubled in size, about 1 hour. Thirty minutes before baking, preheat the oven to 360ºF. 10. Bake at 360º F for about 35 minutes, or until well browned and fully cooked. An instant read thermometer should register about 190º F when inserted into the center. 11. Brush the loaf generously with the melted butter, letting some absorb before brushing more on, if needed. Transfer to a wire rack, and let cool at least 1 hour before slicing. Before slicing and serving, generously sift powdered sugar over the top. I have enjoyed your blog all year. Congratulations on getting so much done! Got any wild plans for 2010?